Quilt Canada 2017 will be held at The International Centre in Toronto ON, June 14-17. I will be teaching and speaking at the conference and would love to see you there! Registration for CQA members opened on January 7th; non-member registration begins on January 28th. To register, please visit Quilt Canada 2017. Take your EQ7 quilt design software to new heights with five diamond design challenges: stunning kaleidoscopes, classic nosegays, pictorial pieced backgrounds and much more! 106A Quick & Easy Turned-Edge Applique: The Apliquick Way! Discover the Apliquick method for turned-edge appliqué. The innovative Apliquick tools provide unprecedented ease and precision for preparing fabric for hand or machine stitching – even miniature-sized. If you have always wanted to learn turned-edge appliqué, or struggled with it in the past, this system is for you. Apliquick rods will be available in class so you can try before you buy, but we’re sure you’ll want a set for your toolbox. Award-winning quilter Kathy K. Wylie has specialized in appliqué techniques for over ten years and she hasn’t seen anything like them! Cutwork is a needlework technique where portions of fabric are cut out and the resulting holes are reinforced with embroidery. Learn how to create this heirloom needlework by machine in a fraction of the time. 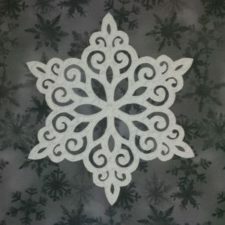 There are four project options in this class: lacy snowflake; glittery snowflake; snowflake quilt block; stained glass snowflake. Our stitches tell our stories; our quilts leave a legacy. 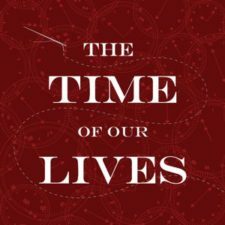 The time we spend with each quilt becomes part of our journey in life, giving us moments of reflection and opportunities for expression. The theme of time has been integral in Kathy’s recent work, as she considers its relationship with the creative life. This evening celebrates the joy in the journey, the quilts along the way, the time of our lives. Kathy’s lecture will be followed by an opportunity for the audience members to show their quilts and tell their stories. 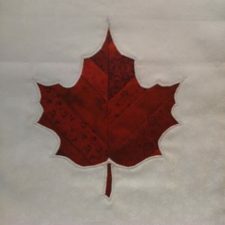 We are particularly inviting the showing of quilts that celebrate Canada’s 150th birthday. Note: Appetizers and beverages will start at 18:30 with the Lecture to follow around 19:15 pm. What happens when you reverse appliqué over patchwork? Peek-a-boo! Use strip piecing to create a vibrant green summer leaf, a colourful fall leaf, or even a red Canadian maple leaf. The result looks like patchwork appliqué! 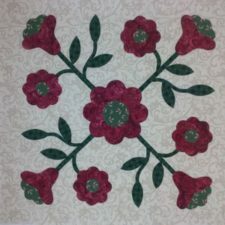 Use this technique to add unexpected detail to your appliqué, make exciting border designs, or transform those orphan blocks. 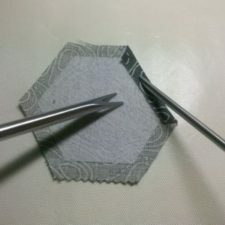 Hexies – or six-sided hexagon patches – have traditionally been sewn together by hand using a technique called English Paper Piecing. But modern times have brought along new options and we will explore them in this workshop. Instead of basting hexies to paper (which needs to be removed), baste them to fusible interfacing. Instead of tracing and cutting dozens of hexies out of fusible interfacing, purchase them precut! And instead of whip-stitching the patches together by hand, sew them by machine in a fraction of the time using a small zigzag stitch.